TV personalities, journalists, doctors and dietitians talk constantly about dietary guidelines. The government and private organizations spend a lot of time deciding how much we should eat of various nutrients, vitamins and minerals. Using these amounts, you can (theoretically) design a balanced diet that will give you all the right amounts of all the right nutrients. But how do you use all that wonderful theoretical knowledge to make more informed decisions about your daily eating habits? You use the nutrition label! Here’s a little more about the sticker’s history and how to read a nutrition label. Food hasn’t always come with nutrition labels. Prior to the 1970s, many foods did not come with this now-ubiquitous information. It simply wasn’t of interest to consumers, given that most food was prepared from scratch in home kitchens. However, all of this changed with the rise of processed food in the second half of the 20th century. Nutrition labels as we know them today were first mandated in the early 90s by the Nutrition Labeling and Education Act of 1990 (NLEA). NLEA allowed the FDA to mandate labeling of all FDA-regulated foods (most packaged items), while FSIS simultaneously agreed to label meat and poultry with the same information. Starting in January 1993 (when the law was enacted), all packaged foods had to bear the standard nutrition label including: calories, calories from fat, total fat, saturated fat, cholesterol, sodium, total carbohydrate, dietary fiber, sugars, protein, vitamins A and C, calcium, and iron. Additional nutrients (e.g. saturated fat and potassium) were categorized as optional, meaning they could be included but were not required. We see these labels so often it’s almost strange to see a food without a label, but do you really know how to read a nutrition label? 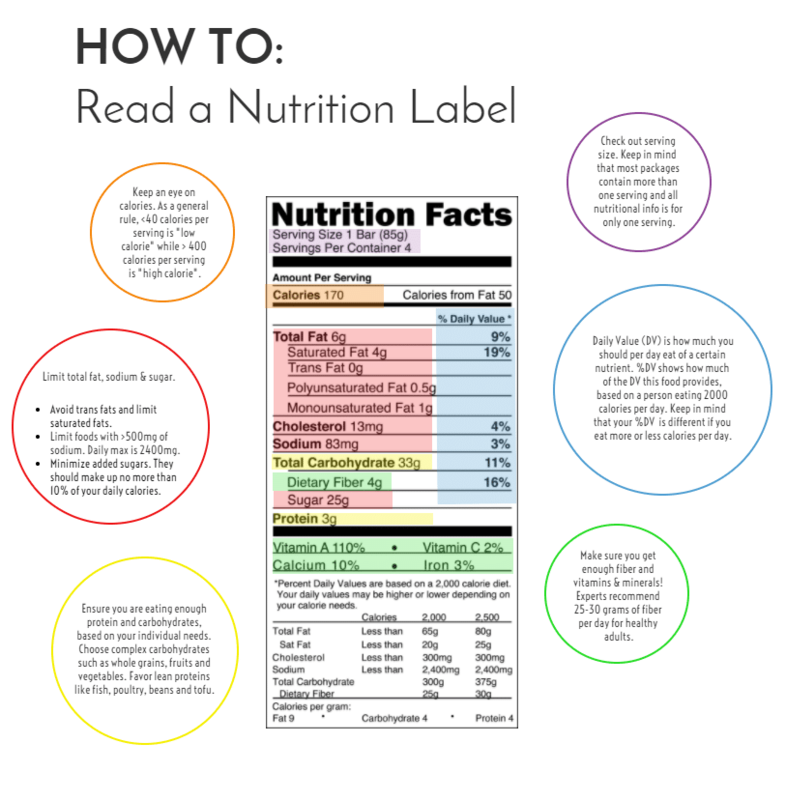 Check out this how to read a nutrition label handout for some quick tips on what to look for in your nutrition label. Keep in mind that calories (and all nutrition information) is related to one serving. If you eat more than one serving, you’re getting more of everything on that label. As a rule, less than 40 calories per serving is low-calorie, while over 400 calories per serving is high-calorie. On the right-hand side are daily values (DVs) for a person eating a 2000 calorie diet. This number shows what percentage of the daily amount of a certain nutrient is provided by a specific food. Over 20% DV is “high” in a specific nutrient, while 5% or less is considered “low”. Limit total fat. Avoid trans fats and try to minimize saturated fat. Instead, look for products where most of the fat comes from healthier, unsaturated fats. Take care to limit sodium intake. The daily limit for sodium is 2400mg, so foods with more than about 500mg of sodium are considered high-sodium and should be minimized in your diet. Avoid foods that have very high levels of added sugars. Added sugars should make up no more than about 10% of your daily calories. On average, this means about 200 calories per day for American women and about 250 calories per day for American men. Make sure you get enough fiber. Experts suggest about 25-30 grams per day for healthy adults, with about ¼ of that coming from soluble fiber. The amount of carbohydrates in your diet should be tailored to meet your individual needs. Choose complex carbohydrates such as whole grains, fruits and vegetables. Make sure you’re eating enough protein each day to support critical functions in your body. This is typically no less than 0.8 grams of protein for each kilogram of body weight. Favor lean proteins like fish, poultry, beans and tofu. Aim to select foods that provide all your daily requirements of vitamins and minerals. Use the percentages to guide your choices with regards to these micronutrients. Knowing how to read a nutrition label can help you make healthier choices each and every day. Using the nine numbers, and the guidelines, discussed above you’re ready to inspect your foods and start making more nutritious choices today! If you have any questions or comments about how to read a nutrition label, please share them with us in the comments section below!